Out of curiosity, do you have an alternative theory? After all, just because it's not a common method of portmanteau doesn't mean they didn't do it that way. No, but it doesn't really matter that much anyhow. I chose 'Mowgli' because 'Moglie' doesn't carry across the 'oh' sound and there isn't really anything better. I certainly wasn't going to defer to the official localization. I also don't really buy the portmanteau theory, since Japanese don't really do portmanteaus in that style; they prefer to instead take the first two morae of each word (e.g. Hagaren for Hagane no Renkinjutsushi). They're called Moguri in both Spanish and Italian, and Mogry in German, both of which are far far more sensible options. -"Seiken Densetsu II: Removed from the game's logo. -Legalese restored to the opening of the text crawl but removed entirely from the end. In it's place is the subtitle "VWF Edition: Relocalized"
-Instances of "Money" or "GP" replaced with "Lucre" or "L"
Bug Report with v1.3: When using shops, be they in-town or via the Wandering Merchant, prices are still listed in GP, rather than the new standard of Lucre (L). The fact the square legalece was removed makes the title screen more...empty? 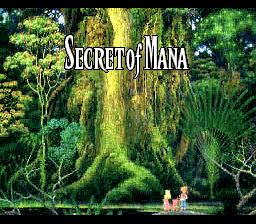 Secret of Mana Relocalized has just been updated to v1.4. It now contains Queue's fully restored Kettle Kin hack, restored religious imagery, and some other neat things. -Replaced last remaining instance of "GP" with "L"
-Changed "Stamina" to "Fortitude" in the Status and Skills Menus. -Added Queue's gorgeous title screen hack and stuck his name in the credits. -Adjusted the intro text to accommodate for the Title Screen hack. -Corrected some very minor shading issues with some of the game's menu icons. -Changed Morning Star to Chain Flail. -Changed Hammer Flail to Chain Hammer. -Changed Flaming Cocktail to Fiery Cocktail. -Changed Twinkly Barrier back to Tinkly Barrier. That title screen is amazing! But probably should remove IMO the "VWF Edition: Relocalized" part to just "Relocalized Edition" or "-Relocalized-" because otherwise it's just a mouthful of a title, and VWF is like wut? Even though I know what it stands for. 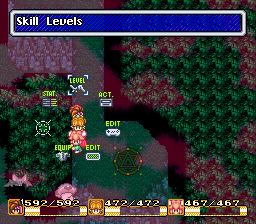 The name of this hack is "Secret of Mana: Relocalized" so that's what should be displayed. Also, I when I first changed "Lucid Barrier" to "Twinkly Barrier" I thought the original Japanese "Tinkle Barrier" was just Engrish for "Twinkle Barrier". Right before I submitted the update to RHDN, I realized that the word tinkle is defined as a clear, ringing, sound, which is exactly how I would describe the sound effect. Why not remove the hacks name from the title screen altogether? My opinion for improvement hacks is that they're better added silently, rather than differentiating itself as a separate version, specially if they're compatible with other improvement hacks. I totally respect if you wish to keep it, though. I am considering this. When I initially added the subtitle, I added FuSoYa's as well because his script is such an important aspect of this hack. Removing it entirely is probably the best decision. I preserved his name on the final credits (It actually appears above my own). That should be more than enough. Don't know if this is intentional or not, but whenever i open a treasure chest that has money in it, it'll still say "Acquired X GP" instead of "Acquired X L"
I'm using this patch along with Kethinov's Level 9 weapon progression patch, so i don't know if using them together is causing that issue, or if it's part of the problem with 1.4 of the re-localization. Not a conflict. Just an oversight. Keep playing your game. I'll get a fix out soon. It won't mess up your saves. Great list. Thanks for doing this. Turbo isn't going to be a single hack. It's a list of optional hacks. More importantly, a lot of the things on this list and in Turbo will cause sequence breaks, spoil difficulty, or make nauseating chaos in places with scrolling backgrounds. I think there is a big difference between definitive and complete. That said, Queue gave me a sneak peak of Turbo and it is going to be awesome. I intentionally left bug fixes out of this edition and provided Queue with what he needs to implement Relocalized in Turbo to let people play the game they want to play. 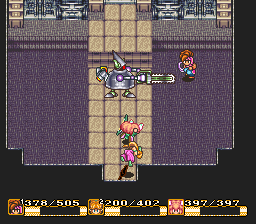 I've actually never played Seiken Densetsu 3 before btw but I am aware that it needs an update. Great work on this and loving the 'restored' title screen!! I've always wanted to do that but never found the time. Always wondered why SE butched the title screen but this looks great! Any chances you'll incorporate adjustments such as making it easier to get all weapon orbs to the final level easier?